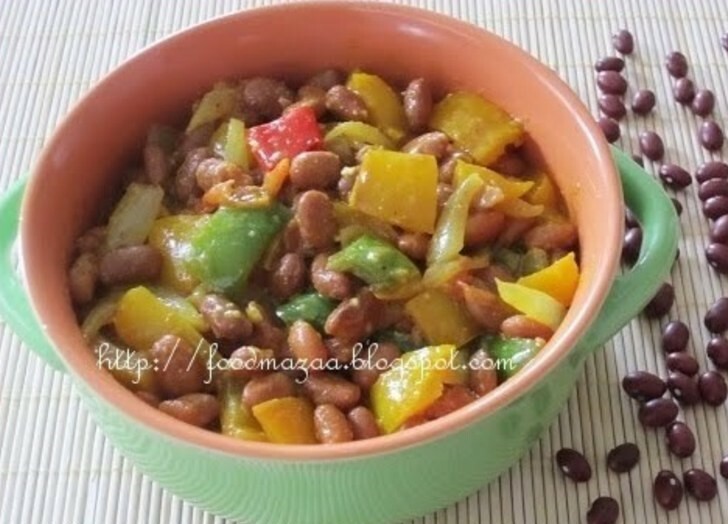 Have you ever tried out the dry version of rajma.with some vegetables added to it ? You can have it as a side dish or just relish a bowlful like salad. 1. Soak the rajma for few hours or over-night and boil them with little salt. Set aside. 2. In a pan heat oil and saute the onion. Tip in the ginger, garlic, green chillies and tomato. 3. Next add the cubed vegetables, salt and spice powders. Simmer on low flame until cooked. Sprinkle little water if needed. 4. Now stir in the boiled rajma and mix. Sprinkle the kasoori methi. Healthy & colorful dish, looks great! very nice and healthy combo of rajma and subzi..I have never tried this.. Very new to blogging. I wondered abt your blog. Really , seeing your blog is like me a foreign tour. OMG .. such a sweet compliment.. You made my day..
curry looks delicious and colorful..
Awww! Lovely! I love Rajma...glad to find ur blog..now joining u! And yes...I was amazed wen music started playing all of a sudden... :) Great choice! wonderful healthy n i love these complete subzis..
Wat a healthy,inviting and nutritious sabzi..Prefect side dish for rotis. Healthy and delicious one!! Thanks for linking to the event !! Appreciate it ! !